I grew up on Fig Newtons; summer days at the pool, my prune and waterlogged fingertips wrapped around these cookies disguised as snack food. Imagine my surprise to see a recipe to make your own lurking in the pages of a book that’s already in heavy rotation in my kitchen. Julia first turned me on to page 145 of Linda Ziedrich’s Joy of Jams Jellies and Other Sweet Preserves way back when she first posted about jelly rolls and fruit bars. Only after my fig jam escapades a couple weeks ago did I finally set to work de-gluten’ing the bars. If you’re not gluten-free, have a go at her recipe directly. Beyond figs, you can make these with any thicker (i.e. non-watery) fruit spread you’d like. 1. Set out 1-1/2 sticks of unsalted butter on the counter first thing to soften. Tear off 3 pieces of parchment paper that are each about 18” long. Cut them in half lengthwise so you have 6 long strips of parchment paper. Set aside. Preheat oven to 350 degrees F.
4. Separate an egg and add the yolk to the butter and sugar and keep the white for sealing your bars later. 6. 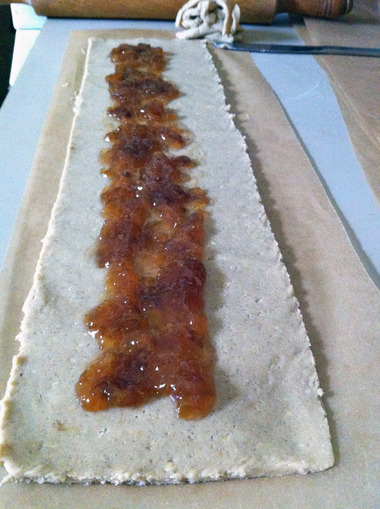 Grab one of your strips of parchment paper and lay one of the dough segments out along the paper. Use your hands to pull and shape it into a long snake of dough. Place another strip of parchment on top of the dough and use your rolling pin to flatten the dough into a long rectangle shape. 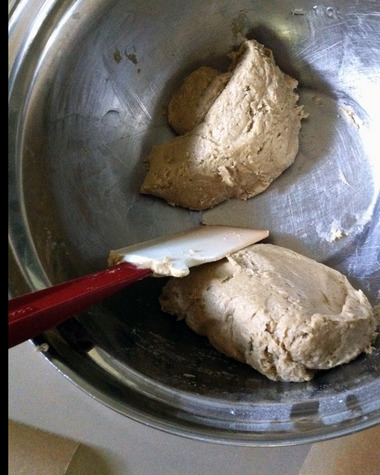 Get the dough as thin as you can without oozing out of the constraints of the parchment paper. 7. Use a butter knife to cut away excess blob-iness and form a real rectangle out of the dough. Aim for a 4”-wide strip, but you don’t need to pull out your ruler; it’s okay if your strip ends up being a little wider. Keep the scraps you peel off so you can make an extra strip or a fun-shaped cookie in the end. 9. Brush egg white along the side farthest from the jam (the right side in my image above) and along both the short ends. 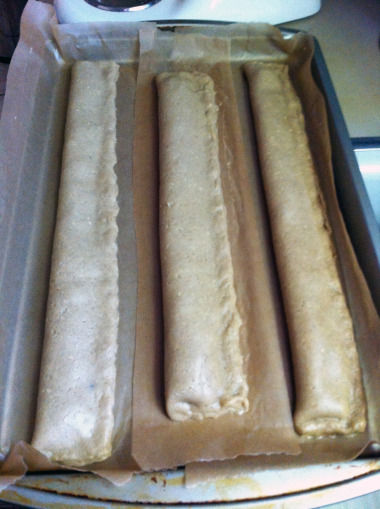 Fold the parchment paper over lengthwise to meet the two sides. Carefully peel off the parchment paper top flap and cinch together the seams with your fingers. The egg wash will make it rather sticky, so you might need to grease your fingers to keep from pulling up the edges of your bars each time you pinch. Transfer strip carefully and swiftly to a cookie sheet keeping the parchment paper underneath. Repeat with other two dough balls. You will need to trim the parchment paper surrounding the third strip since you don’t want to cover up the other two strips. Bake for 20 minutes, rotate pan in the oven and bake for another 10-15 min or until the cookies are firm when tapped. Slice (carefully) while still warm and place individual cookies on cooling rack.